Under the twin-pillar policy, cooperation between Iran and Saudi Arabia extended to joint operations in defeating communist elements in North Yemen, Zaire, Somalia and Oman, but following the assassination of King Faisal in 1975, the Kingdom began to display a new approach towards oil, its major resource. The Shah declared publicly that oil had been undervalued for years and that OPEC urgently needed a price hike. After the Iranian revolution in 1979, religion would be at the forefront of Iran’s state identity. Ayatollah Khomeini claimed broad Islamic support for the revolution and was quick to criticize the “decadence” of the Wahhabi Saudi monarchy. The claim that a Shiite theocracy would be the authoritative voice of Islam clashed with the Saudi Kingdom’s assumed religious legitimacy as the guardian of the two Holy Mosques, in Mecca and Medina. Iranian endeavours to use the media to mobilize Saudi Arabia’s Shiite minority caused further concern in the Kingdom over Iran’s intentions. So when Saddam Hussein made his first state visit to Saudi Arabia, in August 1980, he received approval from King Khalid for his plans to invade an Iran in the throes of political transition. Saudi Arabia provided billions in financial assistance to Saddam’s campaign and pressed for other Gulf states to follow suit. Direct attacks occurred midway through the war; Iran struck Saudi tankers, and the Kingdom responded by shooting down two Iranian jet fighters. In 1987, 275 protesting Iranians were killed in a riot and stampede in Mecca. By the end of the war, an estimated 750,000 Iranians and 500,000 Iraqis had perished. After the war, Saudi Arabia attempted to improve relations with Iran. The death of Khomeini in 1989, coupled with Iraq’s invasion of Kuwait in 1990, provided a modest basis for rapprochement. Iranian President Akbar Hashemi Rafsanjani was keen to explore what regional cooperation could offer. Negotiations at OPEC with Saudi Arabia achieved a 300,000-barrel-per-day increase in Iran’s production quota. Nevertheless, Rafsanjani’s efforts were ultimately overshadowed by a continuing territorial dispute with the UAE and by the 1996 Khobar Towers bombing in Saudi Arabia, in which Iran was widely believed to have been involved. 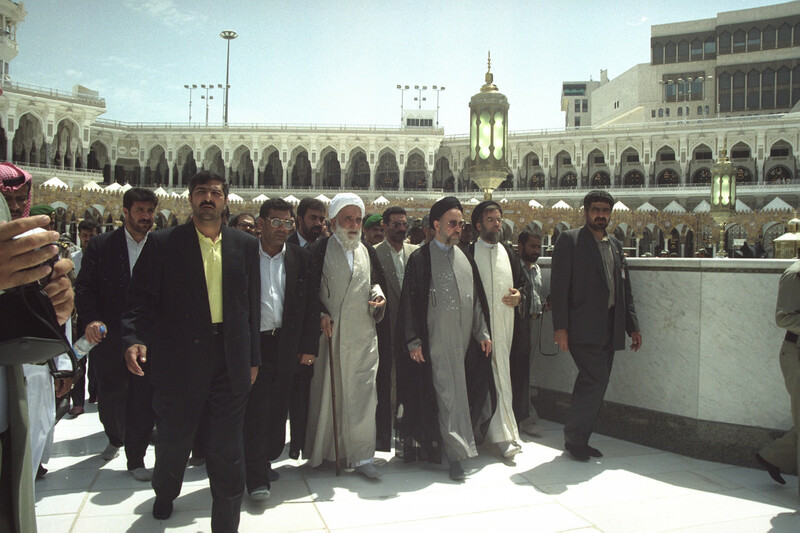 Mohammad Khatami’s election as president in 1997 coincided with falling oil prices and the transfer of greater power to Saudi Crown Prince Abdullah, who was more supportive of cooperation with Iran. Relations developed swiftly, with unprecedented visits by Khatami to Riyadh and a series of diplomatic exchanges. This improvement culminated in two accords, reached in 1998 and 2001, the former a wide-ranging comprehensive agreement and the latter an unparalleled security pact. This long-awaited rapprochement proved, however, to be short-lived. When Saddam Hussein was toppled from power in 2003, after the US-British invasion, the entire regional dynamic was shaken. The Saudis, along with Saddam Hussein, had been able to present themselves as an effective counterweight to Iran’s regional ambitions, but the Saudis could no longer rely on this dynamic. Making the situation worse, Iranian support for the new Shia-dominated government in Iraq and for Shiite militias, such as the Mahdi Army and the Badr Brigade, instilled fear in the Saudis of Iran’s interference in the Arab theatre and its wider regional intentions. When Mahmoud Ahmadinejad won the Iranian presidency in 2005, he promised to revive the ideological vigour of the early years of the revolution. This became evident not only in Iran’s enhanced role in Iraq but in its strengthened relations with the Syrian government, with Hezbollah in Lebanon and with Hamas in the Palestinian territories. 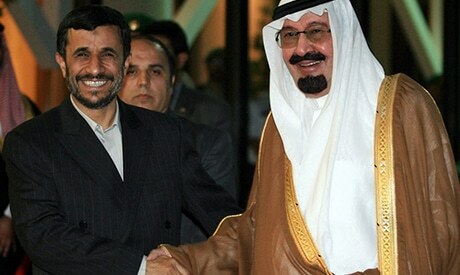 Ahmadinejad’s support for the Palestinian cause also served to emphasize Saudi inaction over the issue by appealing to the Arab street. For more than 80 years, the relationship between Iran and Saudi Arabia has fluctuated between belligerence and cooperation. It has been characterized by entrenched distrust and hasty decision-making. Factors contributing to the relationship, such as the politicization of the hajj and differences over energy prices, certainly pre-date the Iranian revolution, but the 1979 revolution accentuated and manifested more dramatically the regional leadership battle. The merciless eight-year war between Iran and Iraq is fixed in Iran’s national psyche. Attempts at rapprochement after the war were at times promising but short-lived and have been nearly impossible since 2003, with the growth of sectarian strategies. Both Iran and Saudi Arabia have found sectarian partners to be the most effective tools for projecting power across the region. Armed proxy conflicts in Iraq, Syria, Yemen and Lebanon and political uprisings in Egypt and Bahrain are widely known to have Iranian and Saudi political and material support. Moreover, since Iran’s covert nuclear activities were exposed in 2002, the Saudis have feared Iran’s long-term calculus and its potential to attract regional states under its own security umbrella. The patronage of the United States has been used by each side to seize power from the other. The Saudis do not recall the 1970s happily, when Iran was the United States’ principal ally in the region, and this drives Saudi scepticism in 2014 over a potential nuclear deal between Iran and the P5+1. Saudi Arabia hopes, however, that its long-standing strategic and economic alliance with the United States will reduce the likelihood of a return to such a situation.